Scrapbook Page Using the Sewing Technique! I finally did it! I joined my two favorite hobbies, quilting and scrapbooking! On this page I used the sewing technique. I chose a Debbie Mumm nursery background, which I bought in a paper pack at Joann.com . 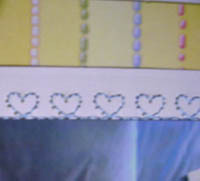 This background paper looks like it is a yellow fabric with vertical sewn blue, pink and white lines. 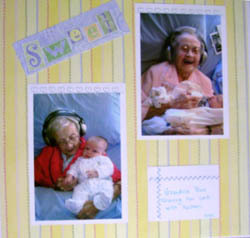 I thought that this paper was just begging for a scrapbook layout that used sewing for its embellishments! The first embellishment I made was to outline the word "Sweet" with blue thread. The word "Sweet" was cut from one of Debbie Mumm's nursery papers. Next I decided to make a small journal tag. I used the sewing machine to make a blue zig zag line across the top and on the left-hand side of the tag. These two simple lines really added a nice dimension to the journal tag! 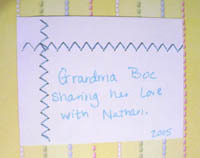 Finally, on the top side of the mat I used for the pictures I made a sweet blue heart border. Just like the zig zag stitch, my machine also has this heart stitch. So this was pretty easy! As you can see, these simple stitches really took this scrapbooking page up a notch and it was a lot of fun to do! Click here to read more about the sewing technique!